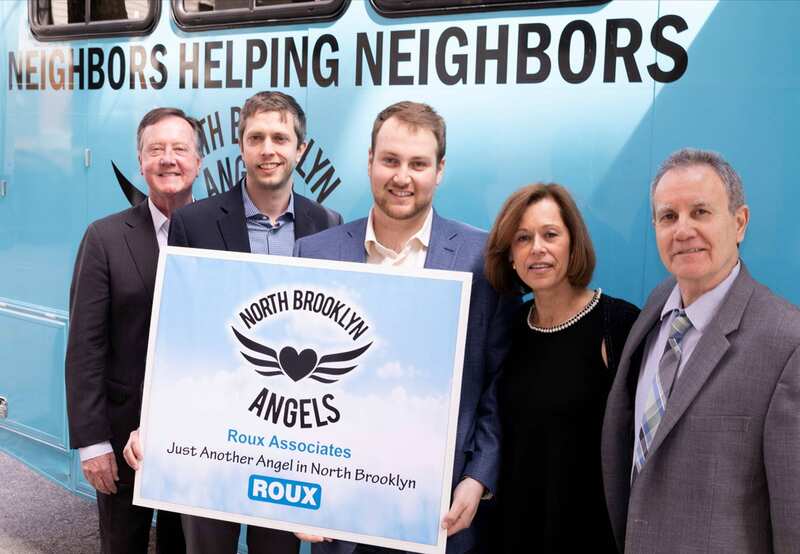 Roux teamed with one of our major clients to support the North Brooklyn Angels, donating one of our work vans to support their food delivery efforts in addition to contributing to their First Annual Luncheon. The Luncheon raised enough funds to support 32,500 meals, contributing toward the 50,000 meal target the organization is aiming to achieve in 2019. Located in Greenpoint, Brooklyn, the North Brooklyn Angels runs a mobile soup kitchen, called the Angelmobile, which serves hot lunch six days a week at various locations around the neighborhood. The food is prepared and cooked by volunteers in the organization’s community kitchen, located in the Mt. Carmel Parish Hall, while additional volunteers set up and serve the lunches. Volunteers do almost everything—from dishes to design. Sometimes, they even drive the truck! Since July 2017, North Brooklyn Angels have been serving a hot lunch Monday through Friday at six sites around North Brooklyn, while also distributing information, flyers, free clothes, books, toys, and personal hygiene products from their community table. To learn more about North Brooklyn Angels, please click here.